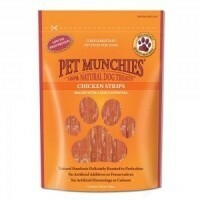 Pet Munchies Chicken Strips Treats for Dogs are made from the finest quality meat delicately cooked in its own natural juices. Pet Munchies Chicken Strips are high in protein and low in fat and carbohydrates , making these delicious treats perfect for health or weight conscious owners. My Dachshunds really loved them. Very good valve treats. My dogs love these, and they smell delicious too. Not fattening either!